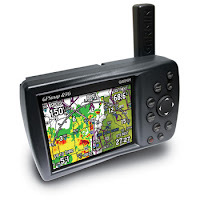 The Garmin 496 comes ready to go right out of the box! With an optional subscription to XM WX Satellite Weather™ and the included GXM 30A smart antenna, I’ll have access to constantly-updated, high-resolution weather data for the U.S, right in the cockpit. Weather information includes Next Generation Radar (NEXRAD), Aviation Routine Weather Reports (METARs), Terminal Aerodrome Forecasts (TAFs), Temporary Flight Restrictions (TFRs), Lightning and Winds Aloft, plus more and can be laid directly over the Garmin 496’s Jeppesen and topographic map databases. 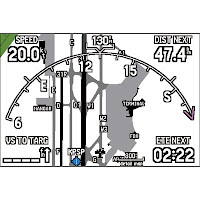 When connected to the Zaon PCAS XRX, the Garmin 496 will even display traffic. Each target is displayed on the map page, and the 496 will also issue pop up alerts for aircraft that are a threat. It’s truly a portable multi-function display. As soon as it arrives and as fast as I can unpack the new toy I'll get a test flight and post a PIREP. Mary and I took to the sky this morning arriving at Wilmington Airport around 9:30 and wheels up at 10:20. We were snuggled in the plane by 10:07 (I looked at the on board clock) pre-flight complete and sitting at idle waiting on oil temps to come up. The ATIS was noted and contact with ground completed as we taxied for runway one via taxiway kilo. Once our run up was complete we had to hold short for two aircraft landing then back taxi for departure. 679er roared down the runway and waggled her way into the air despite a 14 knot sixty degree crosswind with gusts pushing it up to 23 knots (26 mph). We actually weathervaned down the runway heading and turned on course as we passed through five hundred feet. We had a TFR (temporary flight restriction) to deal with just north of Wilmington that was in place for our new Vice President Biden. I pointed a bit farther west to skirt the edge and was at 2,500 feet prior to passing the designated t hree mile ring. We bucked a good headwind going to reading but the ride was relatively smooth. I contacted Reading Approach about 20 south and requested advisories and dialed in my squawk code. I received a traffic alert on my new Zaon XRX and was then alerted by approach to look for Ryan & Kathy's Bellanca at my nine thirty position. I had no visual but did have him on the PCAS. Reading vectored me north east then turned me inbound for runway three one. I had the current ATIS and the runway in site. I was switched to the tower and cleared to land. Mary commented that this mornings landing was one of my best. Slow, soft and not even a chirp of the tires. I wish my throttle work seemed so effortless dealing with the gusting headwinds! Ten of the planned seventeen attendees made the trip. The group made our way to the restaurant and were seated at a reserved table. It was great to catch up with friends from previous fly-in's and really nice to meet some new folks. Ryan and Kathy in the Bellanca take the farthest traveled coming from Williamsburg, VA. Steve from NJ, Gil and Sue from NY and Bob, Rudy and Dave from NJ. Lunch was very good and the service was too, pictured is our Waiter Flynn, who had us cracking up as he worked the group. I'm thinking he may have been on comedy central but can't seem to confirm this. After lunch the group taxied over to the museum. No, not the car taxi, I mean fire up the birds, call the tower and taxi across the airfield. Rudy lead the way in the Cirrus as he alerted the tower that he would have two additional in tow, one Bellanca and one Archer. Ryan was next in line and I was bringing up the rear. Steve was heading back to Jersey and Gill & Sue decided to pass on the museum and visit family in Allentown, just a short hop north. working om aircraft and either the paint fumes or cleaning solvent fumes were just overwhelming. Mary with her asthma did not stick around and instead went back across the driveway to the gift shop. I made my way around checking out as many aircraft as possible and taking whatever pictures I could manage. With all the aircraft inside the hangar it was pretty snug just getting around. I made the rounds through the hangar and decided to see if Mary was ready to saddle up and head south. What a good sport hanging out in the gift shop while I checked out all the aircraft. We said our goodbyes and headed out to 679er. A few shots of primer and she fired up, wanting to get the fluids going and generate some heat as much as we did. I contacted Reading ground and received taxi instructions for departure. Run up completed and tower advised ready to go we were soon cleared to take off on runway three one. Headwinds are still strong as the Archer charged down the runway, we were off. Someone was shooting the ILS runway one three so we turned out at five hundred feet and pointed for home. We switched over to Departure when instructed, dialed in the new squawk code and tightened the seat belts for the bumpy ride home. It was like riding a young horse just broke with just enough buck to let you know they were there but not enough to make the ride terribly uncomfortable. Reading handed us off to Philly and they asked if I was aware of the TFR. Insert [rolls eyes] here, affirmative Philly I have the TFR information. I was vectored further south in order to avoid "clipping" the edge of the designated area. I was a bit ticked the controller made that statement but decided to let it pass for now as to not tie up the radio. I was west of the TFR with Wilmington in plain view as I was waiting for a clear moment to cancel flight following. Philly rolled my call right into his last and gave me the direction of the airport,report in sight and the TFR was about a half mile to my nine o'clock. OoooooK, now I want to say something but I want to be smart not a dipstick. 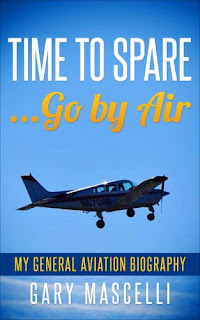 In my best pilot voice, calm and collected, I respond with; Have Wilmington in sight, clear of the TFR at two thousand five hundred, its ceiling is one thousand five hundred, thanks, contact Wilmington tower at two six point zero. I then switch to the tower and as instructed report downwind runway one. The winds were gusting from 17 to 26 knots from 310*. I came in with my left wing dipped into the crosswind and holding just left of the center line. As I am about to touch down I relax the left wing down and blow across to my right now touching down with the right main first and right of center. Smooth but not a happy camper after holding so nice and steady. 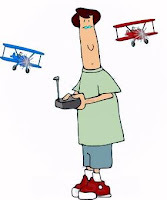 Yes, I heard my flight instructors voice telling me fly it till you tie it all the way to my turn off to taxiway kilo. With the aircraft secured and covered, we bug out of there and head for home. A fun day meeting new friends and catching up with our friends from fly-in's past. Windy and a bit bumpy but still a fun day overall. We did get to fly through snow showers and that was really cool. So, 1.8 in the log book and my flying fix is now good for a few weeks. Looking back over my log book I can't help but realize the need I have for a flying fix. My last real overnight trip was back on December 6th to Cape Cod followed by a short hop to St. Michael's, MD the very next Saturday. 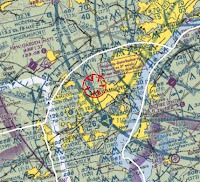 Further investigation reveals I did manage a lunch run/XRX test flight to Millville, NJ that took longer to warm up 679er then to fly the hop back on the 4th of this month. I hate to even mention my instrument rating, my last lesson was on November 28th. I can't wait to get back into shooting approaches so I can knock out the check ride. So, it's been two weeks, that seems like forever. The bitter cold does not help matters since one really can't be outside getting into projects or puttering around the airport finding things to do and people to talk to. I did manage to drive by and check on 679er Friday after work, her fresh clean cover is back on and all the "remove before flight" flags are exactly where they should be. I guess flying MS FlightSim will have to entertain me until the temps get back above freezing. I have been working on my instrument flight by shooting approaches and working with ATC online through the VATSIM online flying community. It's as close to real as it gets and it does help keep your skills sharp. Thankfully the North East Flyers are gearing back up for another fun filled year of fly-in adventures. First event will be a fly-in lunch at KRDG, Reading Pennsylvania. 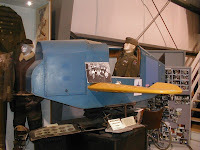 Good eats at the on field restaurant and a great air museum for the traditional, walk off all that food tour. 60 days until spring.....but who's counting. Yes, I know, I once again reserved a cabin at Gaston's in hopes of finally making this annual pilot get-together. In the past my blog entries were titled "Gaston's or Bust" and they were all a bust. June 08 was the closet we would come to making the trip but at the last minute sold our room to a fellow Pilot and forum member of Pilots Of America (blue board) and we made the decision to head south to Lakeland Florida to partake of the Sun-n-Fun adventure. Well, It's the new year and I'm looking forward to expanding my flights west, south west even and this trip will do just that. The forums are already buzzing with Gaston's chat, the Blue board, Purple Board and even Red Board have pilots interest peaking six months in advance! Mary has already made it clear that she will not attend Gaston's. I have more vacation time available and she would rather use her vacation on destinations we would both enjoy and have things to do rather then make it an all weekend aviation theme type deal. To put it bluntly, she would rather not watch airplanes come and go all day in the heat and humidity. I'm ok with that, heck I wouldn't want to shop all day. So, with a compromise she has insisted I go play with the boys, gawk at all the toys and have fun. With the thoughts of now attending Gaston's I really need to schedule my IR check ride. That's right readers, I haven't f inished yet. Relax, I will get it done! Since Mary (and Santa) conspired to get me a new airplane toy, the Zaon XRX, I am giving some thought to upgrading my GPS. Currently I have a Lowrance Airmap 1000 as my back up and love the big screen and the great battery life. However, Lowrance does not have XM weather available and I'm very much interested in that addition to the cockpit tool bag. 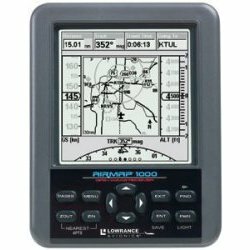 I'm looking at Garmin 396 and 496 units. I want to have weather available and have the ability to connect my Zaon Collision Avoidance System to the GPS to provide potential target on screen. All this thinking and wish list stuff is still in the preliminary stages, it will take time to unfold. Until then I have plenty of time to flight plan and dream about flying to Gaston's!! Traffic awareness is everyone's concern, but so has been the cost of traffic systems. PCAS XRX is the first ever portable, passive, stand-alone collision avoidance system for general aviation to offer direction from within the cockpit. PCAS™, or Portable Collision Avoidance System, is Zaon's solution for providing high-quality, low cost traffic information to the general aviation pilot. XRX delivers the three dimensions of traffic information that pinpoints where traffic is located; direction, range and relative altitude. The most important job of any collision avoidance system is to tell you what is a threat, and quietly provide information on traffic that is not a threat. An important distinction with PCAS is the difference between traffic detection and traffic alerts. XRX will detect any aircraft in the detection window you specify, but will alert you to traffic that has become a threat based on the aircraft's relative altitude, range, track over time, and ascent/descent status. I'm solo on this flight today so there won't be much video of the actual equipment in action. The XRX is completely packaged in a hard shell box which protects the unit and makes the transition to the aircraft neat and orderly. Hook up was pretty simple and the start of the video shows the mounting position. It did take some getting used to having it sit in my line of sight. I may move it to my left or right and use the 45* setting, I'll figure this out as I get to use it on my various flights. I changed my screen to show the 3 mile 'zone of safety' ring, I think it helps track targets better. On the left side of the screen it shows the distance and altitude difference from my aircraft to the target and it continually updates. It has various audible alerts that were not to distracting but I will work with that as I get more familiar with the system. I made a video but there is no shots while in the air. Millville gets busy and I much rather "fly the plane" with my head on a swivel then bend metal keeping my eyes inside. I'll have a fellow pilot or Mary ride along next time when I fly. I'll get them to video the PCAS in action.